You may think given my adoration of Christmas cookies, that I don't make anything else for the holidays. That's not true. I make cake. No, not fruit cake. Bad, bad childhood memory. 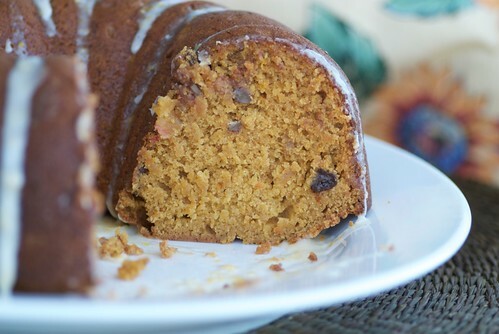 I prefer this Spiced Sweet Potato, Cranberry, and Pecan Cake with Orange-Cinnamon Glaze. I created this recipe last Thanksgiving and have made it a couple more times since, tweaking here and there as I go. With cranberries, pecans, cloves, and orange, it smells and tastes just like Christmas. This the final weekend to send in your Christmas cookies! Find out how here. The deadline is Sunday, December 20th at midnight PST. And don't forget to check out the stash of Christmas cookies we've gotten so far. This cake tastes even better the next day, so it's ideal for a Christmas brunch. 1. Place rack in center of oven and preheat to 350 degrees F. Butter or coat with cooking spray a 9-10-inch Bundt pan. 2. In a large bowl, stir the flour, baking powder, baking soda, salt, cinnamon, nutmeg, and cloves. 3. In a separate bowl, add butter and sugars. Using an electric mixer on medium-high speed, beat the butter and sugars. Add the sweet potatoes and eggs and beat. Add milk, honey, and vanilla, and beat. Add the flour mixture in small batches, beating after each, until just incorporated. Stir in pecans, dates, cranberries, and orange zest. 4. Bake for 50 to 60 minutes, or until the cake is golden brown and a cake tester inserted deep into the center comes out clean. Transfer the cake to a rack and cool for 10 minutes before unmolding. Cool at least 30 minutes before glazing. 5. Icing: In a small bowl whisk 1 cup confectioners' sugar, orange zest, and cinnamon. Add a few droplets of milk, and continue whisking until the icing is smooth and thin yet clings to the back of a spoon. Using a spoon, drizzle the icing in the grooves of the cake. Garnish with a few orange zest curls and/or chopped pecans, if desired. Allow to set for at least 15-20 minutes before slicing. You know I love the Bundt! This looks fantastic!! Delightful! That cake is really festive! I bet this cake is really moist. The flavors sound just great! It sounds so good, and I could definitely adapt this to a lower-sugar version. I just bought my first springform pan. Now I guess I need a bundt pan too! I love the combination of sweet potatoes, cranberry, pecan, dates and spices. I can almost taste it! Great recipe! Thanks for sharing. Happy holidays! This really looks great! Thanks for the link. Mm even just thinking of sweet potatoes and dates together makes me feel cozy inside. Your cake looks and sounds wonderful, Susan! what an absolutely scrumptious combination of goodies, susan! i'm nutso about the thought of that glaze--not only would it be perfect here, but i can also think of a few other treats it'd really amp up! Susan, this looks amazing. What a great combination of flavors. This looks amazing! I am more a cake guy myself, although there's been very little baking this season for some reason. And, I am a Bundt pioneer, so I approve completely! Merry Christmas, Susan! Yum yum to a different cake. I'd love to make your fave cake Susan...gorgeous flavours in there. Susan, this looks amazing! My kind of cake. 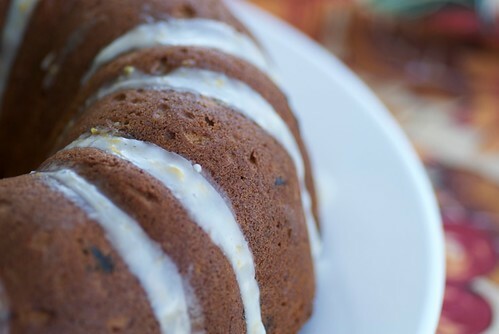 Yoru cake looks so moist and delicious..perfect for the holidays. I'm reading through the recipe muttering, "check, check, check" then, "Yay, I can make it!" It looks fabulous! While baking, this cake must perfume the house with instant holiday cheer. Looks lovely. Hi Susan! I made this cake yesterday for a friend's party and everyone loved it! I used the prunes since I didn't have dates. I loved the tart cranberries and might even put more next time. I'll definately be making this again. Thanks so much! Karen P.
Oh what a wonderful Merry Christmas Cake! Sweet potato and cranberry! A most Merry Christmas to you Susan!